5 Drone Battery Care And Safety Tips to Keep Them Healthy. Drones that use higher end batteries require their own rules for keeping them healthy and working. Make sure to use these 5 tips. Higher end drone models do not use your everyday batteries that you can pretty much do anything with. They are of the lipo category and have their own specific care and safety guidelines that you should absolutely read up on to ensure their lifespan is as long as possible and that you don’t do anything to cause it’s health/lifespan danger (or yours since they can explode…). The great news is that the same good/great drone models these days that use them also have a lot of safety mechanisms in place to help ensure that in most cases, they will be fine and nothing dangerous will happen to them. But there’s PLENTY of foolish things the owners of those batteries can do to wipe away that “safety net” that’s in place and honestly, the tips I will be providing you today are really a matter of NOT doing those foolish things. If nothing else, if you just read the user manual on how to take care of these things, you will really be implementing the most important guidelines. What I am writing here is more of what I have personally experienced to help them last longer. Every single lipo/drone battery comes with it’s own measurement of mAh which stands for “milli Ampere per hour”. What’s important to really understand with mAh isn’t it’s abbreviation, but what it “really” is and that’s a measurement of your drone’s battery life. The easiest way to describe mAh is to compare it to a gas tank in a car. Your lipo’s maximum mAh is it’s maximum “gas tank”. So when you fully charge it, it won’t go beyond it’s maximum level. 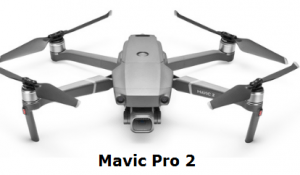 Let’s take the Mavic Pro model for example. It’s battery has a starting mAh of 3,830. That is basically a measurement of it’s “gas tank” when you first start using it. When I first got the Mavic Pro and charged it up, the maximum charge at the time was in fact 3,830. Lipo batteries have a ever decreasing lifespan. The tips I’m going to give you slow down that decrease significantly and prolong it’s life. Starting from the maximum mAh it starts from, the first time you charge it, use it, charge it again and keep repeating that, that maximum number goes down and will continue to do so until it hits 0 mAh. With the Mavic Pro battery, I’ve used it for several months and now my maximum mAh is slightly lower, at 3,694 mAh. So after using this for several months, quite a few times, at least 1-2 dozen, I’ve only lost a little over 100 mAh which is awesome in my opinion. I’m very slowly losing the mAh which shows I’m doing the right things to keep it healthy and honestly, it’s the same 5 tips I’m going to give you. At the rate I’m flying my Mavic Pro, I can literally get about 2 years or possibly even more worth of flights with this ONE battery alone and frankly, most people could too if (again) they JUST do the things I’ll show you. You have to understand that your drone’s lipo will eventually run out of energy. The biggest impact you can make is to make sure that run off doesn’t happen as quickly. You can easily get 2-3 times more life out of your lipo if you just follow some basic rules and tips. A) After charging them, let them remain at a room temperature for about 20 minutes before putting them into your drone model. Don’t put them in and start using them immediately after charging. B) Let’s say you flew your UAV around and it’s time to set it down. If you take the lipo out, do NOT charge it right away. If you have a spare one lying around, sure switch it up and put it into the drone, but the one before it that you just flew with, take it out, let it cool down for 20 minutes at least, then charge it up. You have to understand that if the lipo is hot or warm after use (which it will be), putting it into charge or right away using it to fly immediately after charging it puts extra pressure on it and that can negatively affect the mAh and cause issues. These things are very sensitive so it’s best to use them/charge them when it’s cooled down, before and after use, that’s the rule of thumb I’ve been following. 2) After charging the lipo fully for use, try to use it within a 24 hour period and get it under 50% at least after use. Another important rule of thumb is that lipo batteries need to be used after they are charged fully or at least above 50%. The goal is to use up the charge as soon as possible and within 24 hours so that the full powered battery does not just sit around and put pressure on the system. Again, back to the sensitivity thing. Lipo batteries need to be used after they are charged. My general rule is, after I get a full charge in and am ready to fly, I’ll make sure it’s at least UNDER 50% after use. Usually keeping it above 50% or worse at a 100% drains the overall mAh and though it may not kill the lipo outright, it will impact it later on and potentially cause it have to issues later on. So again, after you charge it up, use it as soon as you can (wait at least 20 minutes though) and get it under 50% at least. Then only charge it up again when you’re ready to go out for another flight. 3) Store/keep it the lipo in a dry/cool area. This is one of those looked over “rules” people neglect constantly. They store the battery in the wrong areas. If you read the manual of your drone battery, you’re bound to see a whole bunch of bullet points on what NOT to do with it. There’s a reason they put up all those rules in the manual: Because they are IMPORTANT. Storage is one of those highly overlooked, yet critical points. Keep it in a 70 degree (Fahrenheit) or lower temp. Basically anything that’s room temperature and NOT overly hot/overly cold (freezing) or in the sun is fine. Do NOT keep it outside right where the sun can shine on it. If it’s stored in a place where temperatures are extremely hot like a garage, car (trunk), warehouse, out in the sun, on the beach, all on warm/hot seasons, this is a HUGE mistake and extremely dangerous for the life of the battery. Also the same environments in the cold seasons are also damaging, so do not keep it there when it’s cold either. Somewhere between above freezing to 70 degrees is fine. Also be very careful if it’s humid outside. Keep it in as dry of an area as possible. I will never forget how I came home one night, took a shower then decided to clean my drone by taking it into the bathroom and wiping it. The bathroom was still humid from the shower I took and I remember just how quickly my battery started developing these “marks” which I immediately assumed were from the humidity. I quickly ran out of the bathroom and put the drone in a safe place. Luckily the battery and drone were OK. In any case, if you’re caught outside and it’s humid, raining, misty, ect…, try to keep your drone stored in backpack, or car (if it’s not too hot outside) so at least it’s protected as much as possible from the humidity. One other thing to note is not to keep them in places where temperatures can change rapidly. That has a VERY detrimental effect on the lipo battery. If it’s not discharged enough, it can actually explode if temperatures change up and down too quickly, which is why keeping them in one place at room temperature is the best place to do it at. And also, extremely hot/cold temperatures can also cause the battery to NOT charge and show errors. In this case, either wait until the room temperature is normalized as is the lipo and/or if the errors continue showing and it won’t charge, try to do a FULL discharge before attempting to recharge it again. In short: Keep it in your house/apartment, in a place where the sun doesn’t shine on it and the wind from a window doesn’t blow on it. Do not keep it outside, in hot/humid areas or cold areas for that matter. 4) Try to use the battery up at least once every 1-2 weeks. It’s pretty clear you’re not going to be flying your model around 24-7, so most of it’s life is going to be spent laying around or going with you on trips (still laying around), waiting for you to take it out. Well during that time, the battery isn’t exactly frozen in time, it’s still going through a discharge period. For most models, it’s set to 10 days, and you can edit it to be less. Personally, I leave it on the default (10 days). After that period, your battery will start to drain itself until it reaches 0%, although from what I’ve heard, it never really does get that far because there’s always some sort of safety mechanism to ensure it doesn’t get to 0%, otherwise it’ll die. As a precaution, before it “fully” discharges, I make sure to charge it up fully, use it and get it to be under 50% as I said in one of the rules. This keeps it healthy and active and positively impacts it’s mAh. In short: Keep using the battery every few days or once every week or two. That’s how I do it. It’s also another thing to consider if you’re going to get mass batteries. You will have to discharge all of them every once in awhile, which can be an annoying process if you don’t fly often so buy extras with this in mind. Note: Going on an actual airplane flight? Here’s important flight rules for taking drones with you. 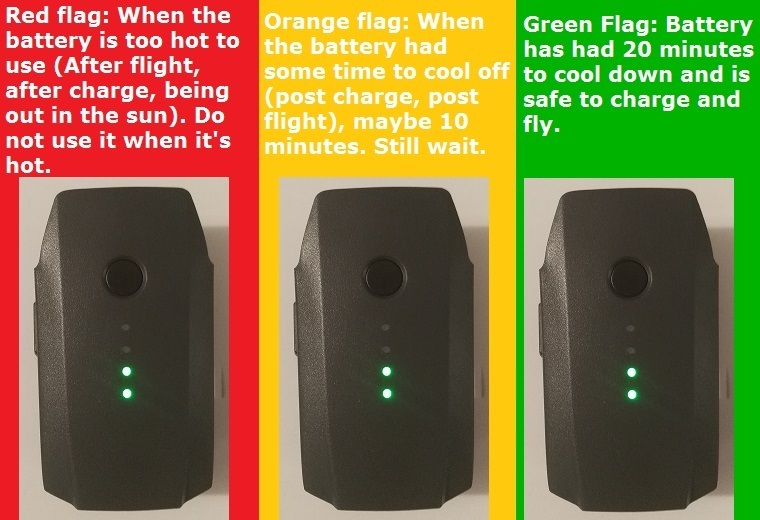 5) If the battery, on it’s own is on (green lights are on), do not put it in a drone, or charge it. Wait until the lights cease to show up, then it’s safe to charge/put it inside the drone. Sometimes you can accidentally press the on button while trying to put it inside your model or when you’re trying to put it inside a port to charge and this can affect it negatively. Wait until the green lights stop blinking, then do what you need to do. 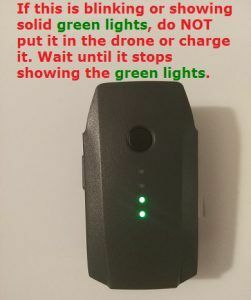 Also, if it’s in the drone, and you turn it on, obviously, do not take it out until it’s no longer showing full green lights or blinking green lights. I suppose when you buy something as expensive as these things are, this rule is pretty much ingrained, but people can really mess this up and mistreating your battery can impact it’s mAh and cause it to act up. Dropping it is bad obviously. Keeping it in the wrong environment is bad. In short, treat these things well, because they will serve you longer and also ensure your drone flies more safely without a hitch. Excellent explanation of the mAH in reference to the batteries! I am an avid air softer and have a couple that take lipo’s as well, and it took me a while to figure out most of this info about mAH and the cool down. Adding your site to my favorites, would love to get a drone! Hi Joe, I would assume the things you use your lipo’s for also have the same idea behind them so these tips would absolutely help there as well. In any case, it’s just good tips to take care of lipo batteries in general. Thanks so much for this article, I have actually just bought a drone and I am prone to breaking things. Especially battery related. There were a lot of things I wasn’t so sure about like cool down, when to use and when to charge. Why do the lipo batteries need to be used after they have been charged though? Will it break a lot quicker if I don’t use it right away? Hi Freddy, a fully charged lipo battery when not used puts extra pressure on the mAh and drains it’s life. This is why you want to use it when it’s fully charged and get it down to 50% or less as soon as you can. I love this webpage. I have a drone and have had to buy batteries because they would not take a charge, now I know. Thank you for this information. This will save me a lot of money now. Also I did not know what the mAh stood for. Now I know. I will make sure they cool down before I use them and before I charge them. What kind of drones do you use? Not every single one uses lipo batteries, but if you have ones which do, then yes, apply these tips, they’ll work well Mike. Elo! Hey what an insightful article. Unfortunately I don’t have a drone yet, but is definitely on my next 3 year bucket list 🙂 The charging techniques you mentioned regarding discharging as much as possible before recharging I have been doing with all battery powered devices for years. I haven’t however heard of letting the battery cool down before recharging. Now when I think about it, it seams like common sense. I have the RAVPower ACE series with fast charging (Output DC 5V/5.8A Total, 2.4A Max Each). It doesn’t charge my Samsung Galaxy as fast as their fast charger adapter but it’s much faster than other external battery packs. The technique below increases my battery life by 3-6 hours (of course it always varies based on use, I use my phone quite often as I am an interactive media developer). Step 1: Run your phone battery all the way down, until it shuts off by itself. Step 2: Keep your phone off and plug it into your external battery pack (preferably ones that have increased charge speeds). Step 3: When fully charged, turn on your phone while still connected to your charger. Step 1: Charge your phone with the adapter that came with it. Step 2: On next recharge (can be any level below 10%), charge it with your external battery. Do this two or three times per month and you will notice a huge increase in discharging time. I haven’t shared this with anyone else, but has worked awesomely for me. I usually get 12-15 hours per day while actively using it (mainly on social networks, photography, messaging, and photo editing). My theory behind this technique is to discharge the phone beyond its capacity (automatically turning off the phone). Then charge it to max with an external power pack. Because any external charger is much slower than the Samsung fast charger. This allows the cells to fill up at a slower rate as to stretch its capacity. Then when using your phone it discharges to the extra cell space it reached to from the slow charge. In short, its like the difference between filling up a container with liquid as fast as possible by compromising space for speed and filling up a container slowly by compromising speed for space. I’m not an electrician so I may be wrong on the details, all I know is it works wonderfully for me. Whats your take on all this being effective to drone batteries and the mentioned tips? 1) I have heard at least ONE authority figure I trust on drones, batteries, ect… talk a lot about the things you mention here, especially the part where you mention letting the phone shut off on it’s own (a full discharge to occur). The person I’m talking about also says to do the same thing with drones, and only then to recharge the battery to full capacity right before the next use (of course after it’s charged, the advice is to let it cool down before activating the drone with it). 2) What you mention about the cells refilling slower, yet more densely also makes a lot of sense, which is why a full discharge before a charge helps a ton and also using the main power cord which came with it, on a home outlet is the way to go, something which you stated people should do with their phones. I would agree, this same advice applies to drones. 3) I have charged my Spark drone via an external, portable outlet and the charge was quite slow, perhaps my external charger wasn’t all that powerful, but in any case, other than that, my other experiences in charging the battery has occurred when I was charging my Mavic Pro and Phantom batteries through a power cord that connects to my car. I noticed in both cases, the battery would charge faster than if I did it at home, yet, there was a “feeling” (I didn’t record this so I’m speculating) that after it was charged, it discharged faster upon use in the drone. Perhaps this also further points to what you were saying in your bucket and water analogy. In any case, I will say that the default rules I’ve mentioned in this post will totally help most drones and probably people who use lipo batteries in general out a lot, but I am curious to test your steps on the drone the next time. If I do, I will be sure to let you know what kind of results I received. Thanks again! 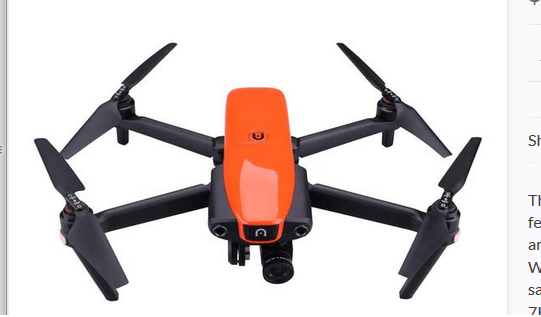 I am interested in purchasing a drone and one issue was battery use. A buddy of mine owns one and he complains about the battery all the time. I always thought drones were a waste just because its only an X amount of flight. These techniques will definitely help out with the timing. Just by keeping cool and safe! I will show him this site. The camera angles you can get even with extra time will give an edge. I’d like to know what model your friend flies Jonathan and how he takes care of the batteries. Also a lot of models out there have a 20+ minute flight time PER battery (which you can recharge to fly later for the same time). A 20 minute PLUS flight to me is perfectly fine and I always have a spare just in case I need to film other things on trips I do. Great tips that a lot of people don’t use! I do have one question about the 50% rule. I had heard that the sweet spot for most batteries is between 20% and 80%, and that within that range you are usually alright. Is the 50% specific to lipo batteries, or is it just even better than the 80% marker that other rechargeables use (even less strain)? I’m not sure Brendan, I do know the following tips apply to drone batteries and lipo batteries in general. Other types out there probably have similar functions so I am pretty certain the same types of rules wouldn’t hurt them. 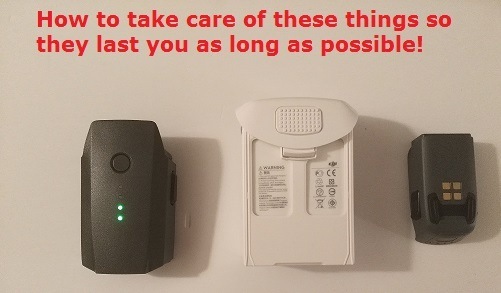 I do know from experience that carrying regular batteries, storing and not using them has led to many of them dying out on me before I even had a chance to try them, and keep in mind they were fully charged when I bought them. Lipo’s however, at least the ones you use on drones are NEVER fully charged and when you first get them, they are always at 50% or less in terms of charge. My son has been wanting a drone for some time now. As part of this process, I am doing my own research. I have to say that I am not experienced with drones at all, so I am trying to read up as much as I can. I found your post on battery care, and I understand that is an important element of owning a drone. I found it very interesting that you should use the battery so it’s under 50%. I do have one question. You mentioned that using the battery every 10 days is important. Does it damage the battery if you don’t use it? Or is it just the fact that the battery will lose its charge? One thing that tends to happen is (with remote control cars) we use them a lot when we first get one, and then it sits around in the closet for a while. Then when we want to use it, the battery is dead. Thank you so much, I really learned a lot. It’s kind of early in the process, but I have a lot more information now, and I really appreciate that. Hi, I’m glad my article clarified droning a bit more for you. The answer to your question is that after 10 days, a natural discharge occurs and it’s really a matter of NOT letting the battery completely discharge. Within 10 days, it won’t go to a full discharge, but it will activate it and if you keep waiting to use it, eventually it will have no more energy to discharge and will basically lose it’s power, the same way your RC car did. Keeping a healthy drone battery is really a matter of keeping it discharged enough (50% and under) when it’s not being used but at the same time, not letting it get down to 0% when it’s inactive. A drone is on my Christmas list this year and aside from knowing which model I want, I hadn’t given any thought to battery care. 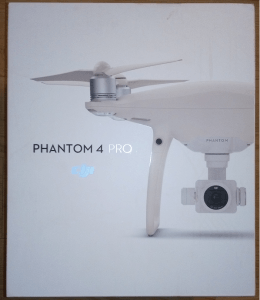 The timing of this post is perfect because drones are becoming ever popular and there will likely be a lot of new ones in the air after the holidays! Those batteries are not cheap, so your tips for making them last longer are super valuable. Thank you for this post! Really helpful. No problem Dani, which drone were you looking to get?